Sometimes when I cook, I feel like Oprah. ONE FOR YOU! AND ONE FOR YOU! AND ONE FOR YOU TOO! Apparently I cook like there is no tomorrow/I’m feeding an army/It’s my last meal. 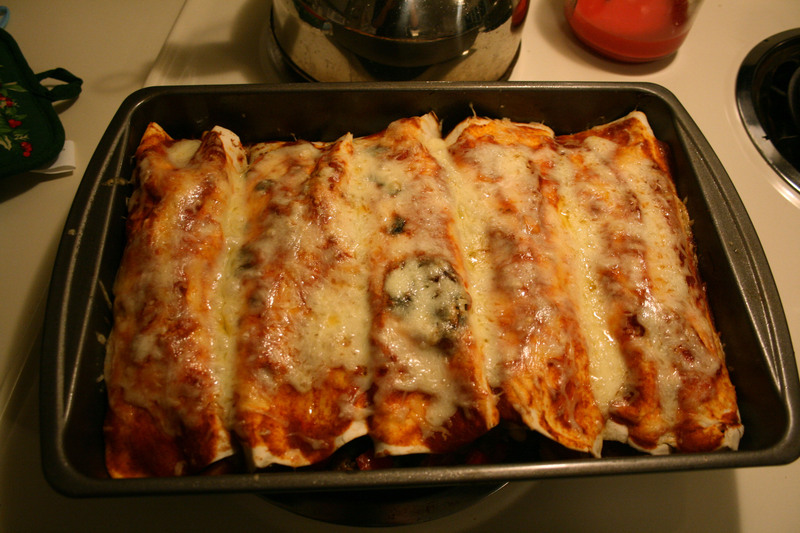 Last weekend, I decided to make some yummy enchiladas. Unfortunately, I took no pictures except for the end result. Typical. Easy enough to make though. I also made my own enchilada sauce (instead of shelling out about $4 for a small can at the store). Put tomato paste in frying pan, add water until desired consistency. Add spices to flavor. Stir. See? Told ya it was easy! Preheat oven to 350 degrees. Brown beef, cook chicken, and add seasoning. Let it all bubble together to blend the flavors. Add sliced olives, corn, and beans together and let marinate together. Saute onions and peppers together. Add to beef/chicken mix. Spread thin layer of enchilada sauce on the bottom of a 9×13 pan. Warm tortillas so taht they are pliable. DO NOT BURN! Layer beef/chicken mix, vegetable mix, enchilada sauce, and cheese in tortillas. Wrap and put seam side down in the pan. Make as many as will fit in the pan. Spread remaining sauce and cheese on top of enchiladas. Bake approximately 20 minutes, or until cheese is bubbling. Enjoy the deliciousness!! Luckily, the Fireman’s friend came over to watch football (woohoo…HA). I served the enchiladas with Spanish Rice…and ended up with a ton of leftovers. Like I said, end of the world cooking. Or preparation for the 6 kids I plan on having. Sorry, Mom, I had to. Couldn’t help myself. Try it next meal time! Easy and cheap.